The Chairman, Senate Committee on Banking, Insurance, and Other Financial Institutions, Senator Rafiu Adebayo Ibrahim, has punctured the allegations made against the person and office of the Senate President, Abubakar Bukola Saraki, by Senator Abdullahi Adamu. 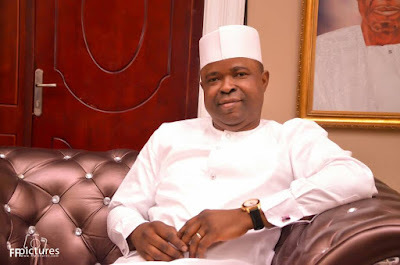 Ibrahim, a former member of the House of Representatives and the Kwara State House of Assembly, while responding to issues raised by Adamu in his exclusive interview with Saturday Sun, said Adamu is hallucinating over the planned impeachment of Saraki. The senator representing Kwara South and one of the new gains of the Peoples Democratic Party (PDP) in the Senate went spiritual, saying: “When you have vicious plan, devilish plan and you are quashed by God Almighty…We are waiting for the 73 Senators’ signatures to remove him.” Ibrahim also reiterated Saraki’s declaration during his recent world press conference that he will be the first to quit office any day he realises that 73 senators no longer have confidence in his leadership. AIDOGHIE PAULINUS spoke to him in Abuja. Senator Abdullahi Adamu said the Senate President got to office through very dubious means. What is your take on that? We realised the old man, Senator Abdullahi Adamu, is hallucinating. The reason why I said that with all sense of respect and responsibility is that it is on record that we came into the Senate, we were inaugurated on the 9th of June, 2015, and you know the build-up to the inauguration, that some forces in the APC then did not want Abubakar Saraki to be Senate President. So, they used both conventional and unconventional means to stop him and to the glory of God, the Senate was inaugurated and he was nominated and there was no second nomination on that day. Fortunately, Senator Abdullahi Adamu was one of those people that were planning a coup that day. To the glory of God, they ended up being trapped by their own coup. They ended up at the International Conference Centre (ICC), calling us for a meeting, probably to trap us there, lock us up and force us to do what we were not willing to do as senators. So, it is on record. I don’t know what he means by being dubious. If you canvass, one by one, I was one of his campaigners. If you canvass one by one and you wanted the senators to vote for you and you got the majority support, what is dubious in that? Senator Adamu also said rather than being seen as desperate to remove Saraki, it is Saraki who is desperate to retain his seat at all cost. Is it true? That is a blatant lie, which is now typical of that old man because it is on record. You know they are now hammering so much on reconvening. On the day we adjourned because of another coup they attempted that day by blocking the houses of both presiding officers, the President and the Deputy President of the Senate, because we wanted to defect that day, they got the information and they tried to stop the defection and to the glory of God, through the benevolence of God through man, the Senate President was able to make it and we got our defection properly and we are out of their party. On that day that we were adjourning, because of the tension they caused, who proposed, who stood up to raise a motion for adjournment? It was Senator Ahmed Lawan. Who seconded? It was Senator Godswill Akpabio. The two of them are now in the APC. So, they should ask them. There was no single nay to the ruling on that day and we adjourned to the 25th of September. Adamu further said the APC senators will use democratic, parliamentary means to remove Saraki because he cannot be in the PDP, a minority party and at the same time, retain the seat of the Senate President. Are you not afraid that they will use any means to get Saraki out of the way? I have told you right from the beginning that he is hallucinating. You know when you have vicious plan, devilish plan and you are quashed by God Almighty, you remember what happened on the 7th of August? Has that ever happened in Nigeria or in any country that has grown democratically to this level? They came in and took over with the aim of bringing them in to do an impeachment. But to the glory of God, Nigerians stood with us at the forefront, that is, the Senators and the House of Representatives members, majorly of PDP extraction, we stood against that tyranny and to the glory of God, the whole world condemned it and luckily for them, one of them was a fall guy. But there have been accusations and counter accusations on the siege, with some alleging that Daura did the bidding of your camp. Is it true? How can that be true? So, that means we are now in charge of the Department of State Services (DSS) in Nigeria. Is it the DSS that has been hounding, harassing and detaining even our members? Recall that recently, Senator Abaribe was in their supposed prison for some days without any tangible reason. So, how can you say the Senate is in charge of the DSS? I think all those talks are too much. You know when you fail in an attempt to subvert democracy; you have to look for excuses to cover your face. For me, all the stories are all about covering face. God loves Nigeria and He has taken charge and that was why that assault on democracy didn’t succeed. So, they could be looking for excuses. If they have sacked him and we learnt that he is still in detention up till today, so, is it still the Senate keeping him in house arrest? They should come out with the full report and luckily, somebody leaked the report by the Inspector General of Police that the guy was even arrested and the report is in the knowledge of the whole world now and it was admitted. So, we are waiting for the final report. Maybe they will now say that we are the ones giving instructions to the DSS and that will ridicule the government the more. Adamu also said the Senate President is living on borrowed times. What is your take on that also? I don’t know what he means by that. We are waiting for the 73 Senators’ signatures to remove him. He said it in his world press conference that if he gets to know today that 73 of his members don’t want him again, he will even leave before the impeachment. He also went down memory lane, saying that while in the APC, the Senate President was always sabotaging the President’s efforts and that Saraki considers his interest above every other thing. How true is this? I want him to name one thing that was frustrated by the Senate President. The only issue we had was the issue of Magu to be confirmed as Chairman of the Economic and Financial Crimes Commission (EFCC). And who did that? Was it not the Director-General of the Department of State Services (DSS) that wrote a report? And you know the Senate President has always said that there is a government within government. And that is not our headache. So, we will just pray for people like Abdullahi Adamu to just relax. We are out of their party, so what is the pain? We have peace here, we are not afraid of not winning an election. That is why we could leave a ruling party, our comfort zone and go to opposition. So, if they are afraid, they should just take it easy. February, 2019 is around the corner. They can use democratic means to remove us from the Senate. That is, election. He also said under Saraki, the Senate became the official opposition political party. Do you agree? How? The Senate under Saraki has surpassed all other Senate in performance. Adamu also said none of the PDP bigwigs can withstand President Buhari in 2019 presidential election. Is this correct? You know talk is cheap, but it’s so clear now that the APC and the government are jittery of aspirants under the PDP. You saw what happened yesterday. What is the rationale for stopping Kwankwaso for making his declaration at the Eagle Square? It is out of being jittery. I am not predicting the result of the election, but we know that we will go into the election with all our strategy and our strength and we will leave the rest to God.